MISSION STATEMENT: The purpose of the Treasure State ATV Association is to support and promote the responsible use of Off Highway vehicles, to protect public riding areas, to actively search for additional riding areas, and to provide a family oriented atmosphere at all events and group rides. TSATV has actively participated in the efforts to keep public lands open for recreation and enjoyment. Many members have contributed countless hours toward these efforts. National Forest Service travel plan processes have taken up the majority of this contributed time. We support and contribute to many efforts on a state and national level with memberships and other related efforts. Although the paperwork and meetings are sometimes necessary, being out enjoying the outdoors and helping agencies through volunteer efforts is very rewarding. Many members proudly display specialized license plates showing our support (See Links). 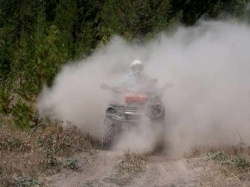 Fostering, promoting, and enhancing the use of ATVs for recreational purposes in the state of Montana. Educating, encouraging, and promoting the safety and responsible use of ATVs. Organizing and sponsoring ATV rides and events. Cooperating with public land management and/or regulatory agencies, but always reserving the right to oppose regulations or actions the Association considers unfair and/or not serving the best interest of the members. Sponsoring the enactment of fair state, federal, and private land use laws and regulations pertaining to the ownership and operation of ATVs. Actively opposing such laws and regulations as determined to be detrimental to the best interests of the member. Actively seeking and building mutually beneficial relationships with other recreational users of public land.